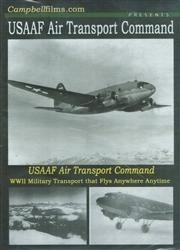 The USAAF Air Transport Command WWII C-46 C-47 DVD contains six World War II era films that focus in on Air Transport with C-46 and C-47 aircraft. Film #1 - Air Transport Command - This film is actually composed of two films combined: the first being - Airlines to Everywhere - and the other is - Airways to the Future. Both are very good post-WW2 films by the Army and show the DC-4 and DC-6 plus others that were used for transporting troops. The film shows the importance of the need to use the transports as an airline. Runtime is about 20 minutes. Film #2 - AAF's Global Operations - This is a US Army Air Forces film about the need for the Air Forces all around the world in every theater. Supplies were needed in great quantity for our troops to fight the Axis powers. The AAF was there in a global war effort to fight and deliver the goods to win the war. This from the USAF Story series, chapter 12, 1943. Coming soon, we will be releasing the whole 24 chapters of the series. Runtime is about 14 minutes. Film #3 - AAF Report - This film is about the status of the USAAF in 1944. This film has it all, production, transportation, bombers, fighters, logistics, training, etc. This is a very nice print and has lots of fascinating footage of the AAF during WW2. Great stuff. Runtime is about 41 minutes. Film #4 - AAF Transport Newsreels - This is a great collection of newsreels on ATC planes. Runtime is about 15 minutes. Film #5 - The Hump - This is a series of newsreels on the C-46 and the C-47 flying the Hump to bring supplies to China. Known as the Aluminum Hiighway because of all of the planes that crashed. Rain or shine, these planes kept flying. Great footage. Runtime is about 7 minutes. Film #6 - C-46 and C-47 Photos and Clips - This is a collection of photos and clips on these two amazing airplanes that we have in our collection. We added sound and effects to the film and we hope that you will enjoy this collection. Fun to see. Runtime is about 7 minutes. Total run time for the USAAF Air Transport Command DVD is about 104 minutes in B&W. Format is NTSC DVD and region-free.